Lite-On (including its consumer SSD brand Plextor) is one of the largest SSD vendors that is not vertically integrated. They don't manufacture NAND flash memory and don't design their own SSD controllers. Their strategy for competing against the vertically-integrated giants relies on picking the right technologies that are available on the open market and making the most of them with in-house firmware development. This makes Lite-On a great source for second opinions about new NAND flash and SSD controller silicon; they have to make their own judgments about whether new technologies are as great as the manufacturers claim, and they get to do so long before we get retail products to test. Lite-On's plans for exhibiting at Flash Memory Summit earlier this month were upended by the fire that closed the show floor for the entire duration of the conference, but they did manage to show me some of the products and prototypes from their booth. The most predictable product Lite-On had to show was the new iteration of their EP series of entry-level enterprise NVMe SSDs. Lite-On is still using Marvell's 88SS1093 "Eldora" controller, but now pairing it with Toshiba's 64-layer BiCS3 3D TLC NAND flash. The result is a M.2 22110 drive with capacities up to 2TB, write endurance rated at 1DWPD, and performance that's nothing special for a read-oriented enterprise NVMe drive. Power consumption and price are likely the new EPX's best aspects, but Lite-On hasn't disclosed those numbers. A consumer-oriented version of this drive—shortened to the M.2 2280 form factor by the removal of power loss protection capacitors and equipped with client-oriented firmware—has not been announced but will likely show up in a few months or at CES2018 as the successor to Plextor's M8Pe or M8Se. Next, Lite-On had an EP-series prototype with two significant changes from the EPX. This prototype featured Marvell's new 88SS1092 "Eldora Plus" controller, and it's the first use of this controller we've encountered. More interestingly, the prototype was equipped with Toshiba's 3D NAND packaged using through-silicon vias (TSVs) instead of traditional wire bonding. Toshiba announced this flash memory last year and showed a die at FMS 2016, but we haven't heard much about this line of R&D recently. Most SSDs—especially M.2 SSDs—need to stack several NAND flash dies in each package in order to reach acceptable capacities. Stacking NAND dies with TSVs gives a higher quality connection between the dies than wire bonding, which allows for faster or lower-power communication between the NAND and the SSD controller, and potentially also for taller die stacks. Lite-On has verified Toshiba's claims by measuring a 20% power reduction and 30% performance improvement for their SSD equipped with TSV flash. Products from Lite-On using TSV flash could appear as early as this year given how substantial the power and performance benefits seem to be, but it is not clear how the cost and manufacturing volume of the TSV flash compares to the mainstream dies intended for traditional packaging. Toshiba is the only NAND flash manufacturer that has talked much about using TSVs, and they appear to have a substantial lead in incorporating TSV packaging into their NAND flash. 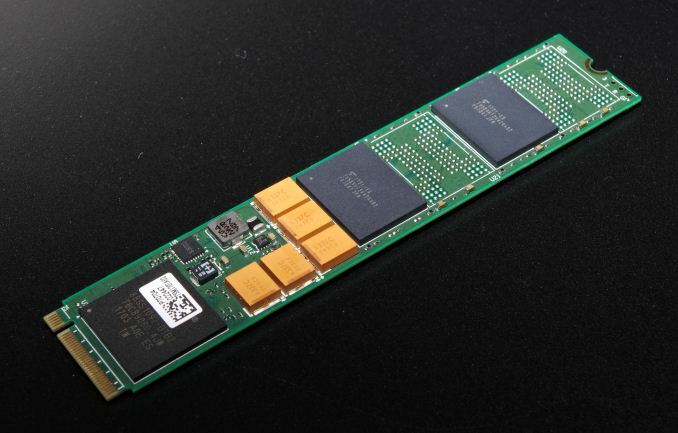 This could translate to a significant advantage for Toshiba in a year or two when SSD vendors are planning how to make multi-TB M.2 SSDs capable of PCIe 4 speeds. Lite-On is continuing their collaboration with controller designer CNEX Labs to develop the Open Channel SSD concept and bring it to market. An open channel SSD allows the host system to bypass the traditional flash translation layer (FTL) and directly manage the allocation of the underlying flash memory. Moving most of the FTL from the SSD to the host system's CPU means the drivers running on the host have to be a lot more complex, but this arrangement brings substantial opportunities for optimization because the OS and applications can better cooperate with the FTL. 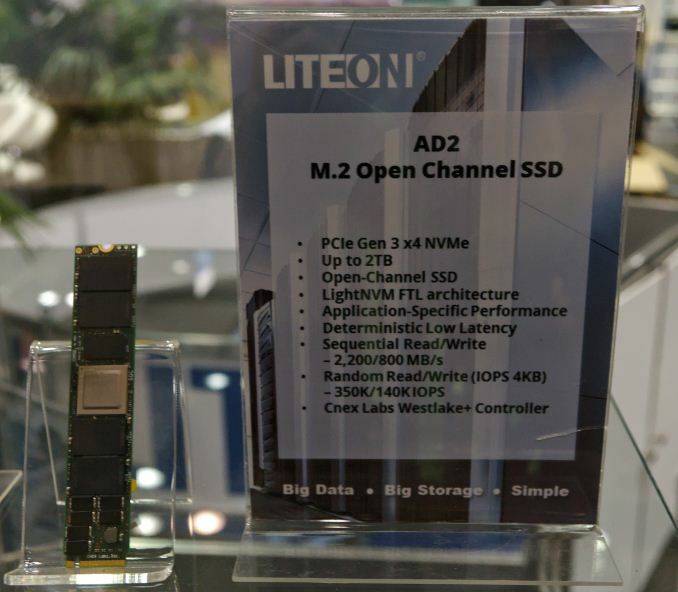 Lite-On's AD2 SSD is a M.2 PCIe SSD using the CNEX Westlake+ controller to implement an open channel SSD using the LightNVM architecture, which extends the NVMe protocol. LightNVM support is built in to recent versions of the Linux kernel and NVMe tools, so the market might be ready for broader availability of open channel SSD hardware than CNEX's development kits. The long-term prospects for the LightNVM open channel SSD approach are not clear: the NVMe standard has been gradually adding support for application-level I/O hints and instructions to enable many of the same performance optimizations an open channel SSD is desirable for, and the increasingly popular NV-DIMM approach allows just as much low-level access as a LightNVM open channel SSD, but through a very different interface. The last drive Lite-On showed off was a prototype M.2 SSD using Microsemi's Flashtec NVMe2108 NVMe controller. Microsemi's Flashtec controller line (previously owned by IDT then PMC-Sierra) has been dominant among the largest high-end enterprise SSDs, with controllers offering up to 8 lanes of PCIe connectivity and 16 or 32 channel flash interfaces. The Flashtec NVMe2108 is Microsemi's smallest SSD controller yet, and their first that is suitable for M.2 SSDs. 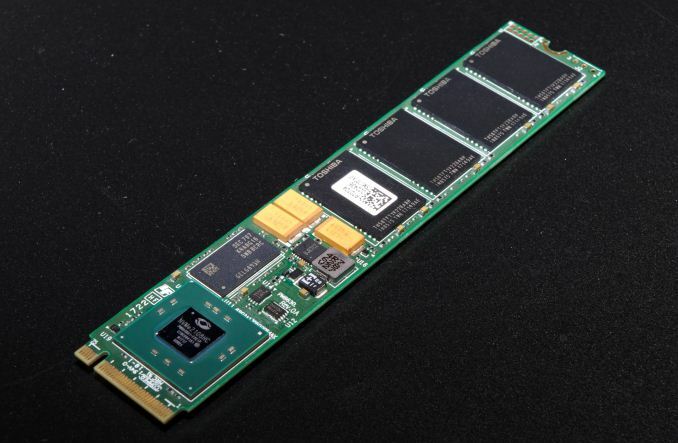 The Flashtec NVMe2108 controller exists in a more mainstream market segment where Microsemi faces far more competition. The 8-channel flash interface on the NVMe2108 controller matches that of most NVMe controllers for M.2 and U.2 SSDs. Lite-On did not share detailed performance information about this drive, but they have achieved random read speeds of over 500k IOPS, which is the fastest that any user of this controller has achieved so far.